The closed ice rink in Ryde and the skating teams that now have to travel to the mainland every week on the 4am ferry to train were the feature of a BBC Inside Out feature last night. There’s still time to catch up on iPlayer – details within. If you missed BBC’s Inside Out programme last night, there’s still time to see the incredible story of the Isle of Wight synchronised skaters and Ryde Arena. 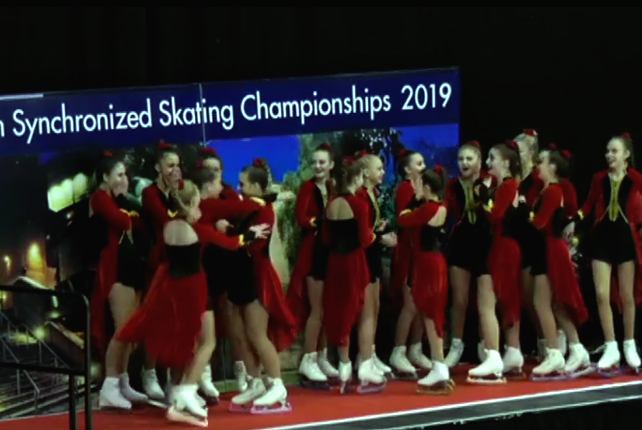 Island’s award-winning syncrhonised skaters, who, for the last two and half years since the ice rink was closed, get up at 3am most weeks to travel to the mainland to train on ice. The weekly travel week, taking the 4am ferry across the water to train and then returning back to the Island in time for breakfast is tiring and hard work for the teenagers, many of them preparing for their GCSE exams. Jon explains that investment company AEW UK paid £1,000,00 for the lease in 2014. As previously reported, the company say they closed the building after the rink operator failed to make rent and insurance payments. He goes on to sday the company plans to now sell up and seek for a change of use with a For Sale tag of £3m+. A local doctor has put in an offer of £800,000 (subject to contract) to buy the rink. She tells Jon that she recognises it needs a considerable amount of investment, but says, “managed well, it would be a fantastic community asset”. AEW rejected the offer saying it had a duty to act responsibly with its clients capital. Isle of Wight Conservative MP, Robert Seely also appears on the programme stating that, “AEW’s behaviour is disgraceful and reprehensible”. “These nasty corporate bullies should be ashamed of themselves. The segment ends on a high with the four synchronised skating teams coming come from the Championships with two second places, one fourth and one sixth! Well done to all the skaters, their coaches and family who continue to offer unstinting support. The programme can be watched again via BBC iPlayer for 29 days (from today’s date).